This dish reflects the vivid colors and vibrant flavors of Mexico. It comes from the coastal city of Tampico where shrimp abound in the warm waters of the Gulf of Mexico. When a dish is called a la Mexicana, you know it is made with tomatoes, onions and chiles. Here, however, only the brine from canned guerito chile is used to provide heat; the chiles are used for garnish. The brine and the addition of thyme make this sweet-hot combination unique. The dish has surprisingly layered flavors and it's perfect to serve over rice or pasta. The shrimp will be table-ready in about 30 minutes. If you use the chiles for garnish forewarn your guest - they are very hot and not for every palate. The recipe can be doubled or tripled if you have a gang to feed. 1) Heat oil in a large saute pan over medium heat. Add onions and cook until softened, about 2 minutes. Add garlic and cook until fragrant, about 30 seconds. Add tomaatoes and cook, stirring, until they begin to release their juices, about 5 minutes. Stir in pepper, bay leaf, thyme, salt and chile juice. Cover; cook for 5 minutes. Adjust seasoning if required. 2) Heat butter in a separate large saute pan. When sizzling add shrimp and cook just until shrimp begin to turn pink. 3) Add shrimp to sauce and cook for 3 minutes longer. Place shrimp on a serving platter. Spoon a small amount of sauce on top. Garnish with parsley and chiles. Pass extra sauce at table. Yield: 3 adult servings. Adapted from a recipe developed by Susanna Palazuelos. This recipe is being sent to Regional Recipes, a montly blogging event sponsored by dp at Blazing Hot Wok. This month's event - Regional Recipes Mexico - is being hosted by Wandering Chopsticks. I've never thought of using brine to cook with, but I guess it'd be similar to using vinegar. I bet that really brought out the flavor of the chiles. These shrimp look so very delicious! I love the flavors you chose with them. You must have the widest variety of cookbooks! I am green with envy. Donna, I don't have a lot of cookbooks, but I do use the library. I've also been cooking for a very long time and take cooking lessons when we travel. WC, that's the principle behind the use of brine. It functions in the say way as a flavored vinegar or oil. With a hot chili you get lots of flavor but a less intense burn on the tongue. Sorry for so late a submission, but this thing called life keeps getting in my way :). Have a great weekend. WOW! Those shrimp look awesome! They really bring to mind sunshine and lazy days on the beach! I secretly like to save the brine from pickles, jalapenos and even pickled herring to use in things like dipping sauces or as flavorings. My favorite use of pickle juice is mixed with ketchup and mayo for dipping french fries. Jalapeno brine goes into salsa and herring brine I use for a mayo-based curry sauce that's delicious on hard-boiled eggs or dipping shrimp. I'm glad to see I'm not the only one who uses the brine. Darlene thanks for some really great ideas. They are appreciated. Your Camarones look gorgeous but I'm crazy about anything with shrimp. I'm not familiar with the guerito peppers; I'll have to keep an eye out for them. It's so much fun to learn about new ingredients. This sounds great. Yes, Darlene, I always have a little guilt pouring the pickle juice down the drain. I will think out of the box from now on and find uses for it. I love food from that area of Mexico precisely for the tomato and shrimp additions. It's beautiful. 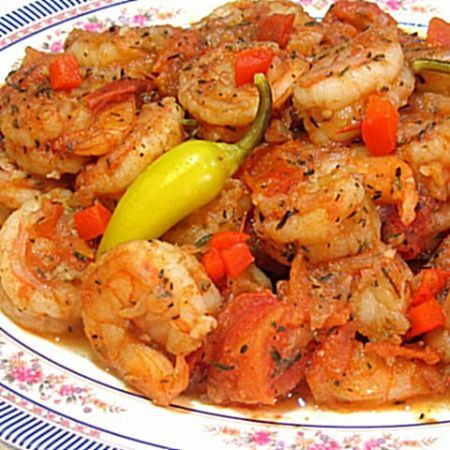 I love spicy shrimp dishes! This looks fantastic!! I live for spicy shrimp! LOL!! And this looks perfect! I love the juice from the peppers, I'll have to try that! those shrimp look so tasty i'm trying to get my tastebuds to like real spicy food. IF, this a great recipe to begin introducing heat to your food. It's hot but will not burn as whole chilies might.